It seems the same is true for the American Library Association Conferences. The upcoming one in Chicago is exorbitantly expensive and that’s not including housing and food (AND drinks…I weep for you, Chicago when the librarians are turned loose…). And what does your hard-earned moola get you? Some innovative library speakers? Some literary experts? I suppose I can understand that certain emergency situations arise and action must be taken…but I don’t think that having a “not-so-fresh” feeling counts. I think I speak for all staff (but especially for the male custodian) when I say that, in the future, you may want to strongly consider cleansing the inner naughty bits of yourself in the privacy of your own home and not the staff bathroom. Or, at the very least, hide the packaging AND the used plastic receptacle at the bottom of the dustbin. 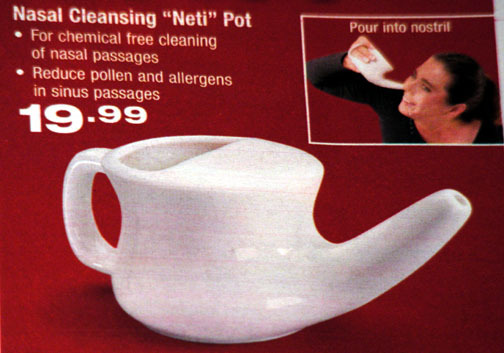 Like a Sippy Cup for Your Nose! WTF?! Do people really buy these things? And who can I give one to as a gag gift…hmmmm…. 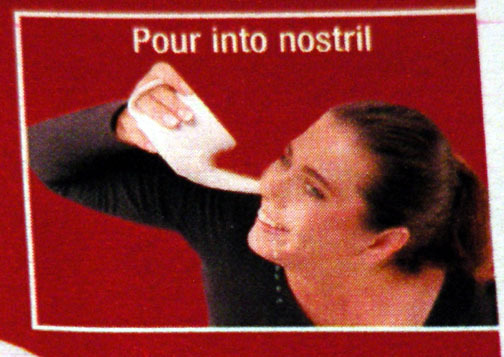 I love the inset picture of the woman puting that up her nose…complete with water dripping out the other nostril. Oh right, like she would be smiling with water shooting up her nose….wheeee!